Known as “the green lungs of the city”, Santiago Metropolitan Park, or ‘Parquemet’, covers more than 700 hectares (1,730 acres) of parkland and is home to countless cultural and sports activities. Public lighting is vital to ensure that local inhabitants, tourists and motorists can get around the park safely. 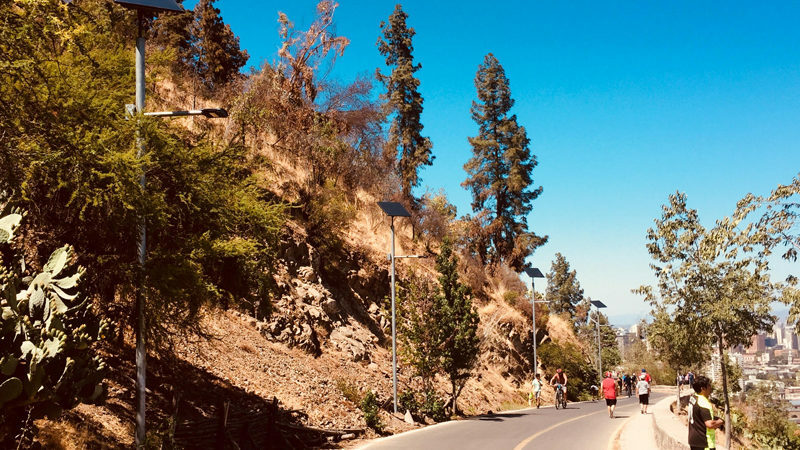 As part of its commitment to preserving this unique environment through more eco-friendly, sustainable approaches, the park’s management selected Fonroche Lighting to install 155 off-grid solar streetlights on San Cristóbal Hill. Out with old the faulty installation, in with a powerful new solar solution! Avenida Pedro Bannen,the road leading up to the statue of the Virgin Mary on San Cristóbal Hill, was already equipped with solar streetlights, but just four years after being installed, it was clear that the system was not up to the task. 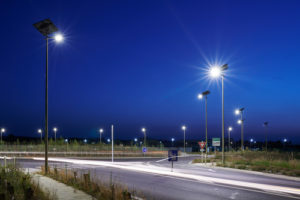 Fonroche Lighting has now replaced the old installation with 155 off-grid solar streetlights based on its unique technology, lighting up the entire road. By choosing Fonroche, Parquemet has secured itself powerful, controlled and sustainable lighting 365 nights a year, plus zero electricity bills. Its Smartlight solar streetlights come with a five-year warranty and require no maintenance for the first 10 years. This is just one of many major projects delivered by Fonroche Lighting that prove the superior performance of our solar streetlights. Avenida Pedro Bannen leads up to the Mirador del Hundimiento, a famous viewing point overlooking the whole of Santiago and a popular tourist attraction. Fonroche solar streetlights now ensure the safety of the countless motorists, cyclists and pedestrians who use the road every night of the year. It’s vital that visitors feel safe here, so they enjoy their trip to Parquemet and recommend it to others. A hillside park makes for a lighting challenge! 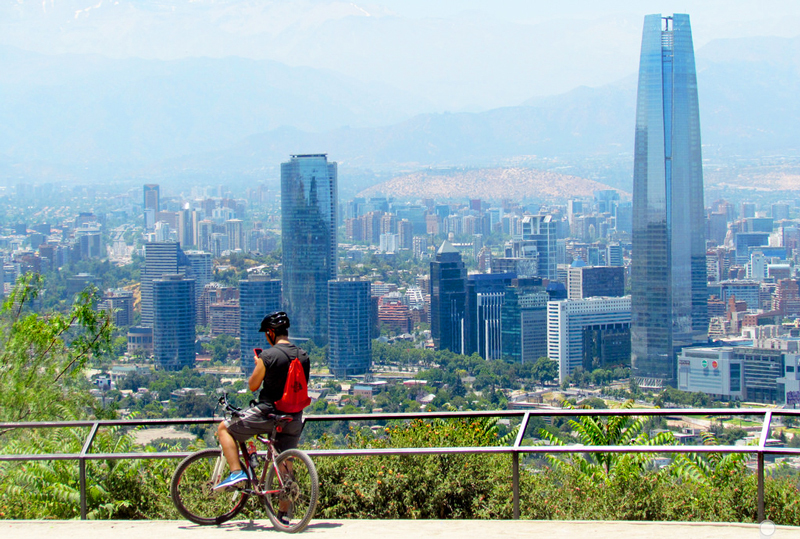 Spanning four hills, Santiago’s Parquemet features mountain-like roads with numerous steep bends, making grid connection tricky. Fonroche solar streetlights offer the advantage of being easy to install. No need for trenches, wiring or electrical cabinets – just one simple concrete base per light. What’s more, they light up on the very first night and incur zero operating costs. Parquemet is one of the world’s four biggest parks and, more than a century after its creation, still welcomes thousands of visitors a day. To protect it and preserve its world-class reputation, an ecopark programme was adopted in June 2018. This means that any new or refurbished infrastructure, such as public lighting, must now be sustainable. Previous Post Annaba, Algeria: solar lights the way to the beach!